The Exhibit Hall is bursting with activity. 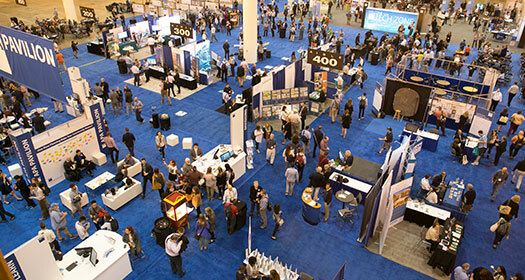 From the APA Pavilion to top-notch exhibits, you'll find this conference hub interactive, invigorating, and invaluable. Hall Hours | 10:00 a.m.–5:30 p.m. Dedicated Networking Break | 10–10:45 a.m. Dedicated Networking Break | 2:15–2:45 p.m. Dedicated Networking Break | 4–4:15 p.m.
Hall Hours | 9:45 a.m.–5:30 p.m. Dedicated Networking Break | 9:45–10:30 a.m.
Hall Hours | 9:45 a.m.–6:30 p.m. Dedicated Networking Break | 9:45–10:15 a.m.
Exhibit Hall Happy Hour | 5:30–6:30 p.m.